Mars’ romantic efforts will touch his Moon partner on a deep level. She’ll feel that she’s found her dream lover, and he’ll be attracted to her need for complete surrender. The result will be a couple who totally lose themselves in each other. Mars in Pisces is searching for the big romance and great escape. He’s not quite grounded in the real world, either because it’s too harsh, or it doesn’t match his ideals. Mars in Pisces will act out his fantasies when he pursues a potential lover and when he’s in a relationship. His ideal partner would be someone who shares his desire for escape. The downside to this is his distaste for practical necessities and (sometimes) a tendency to undermine himself with weak boundaries and addictions. His pursuit of the dream can lead him down some questionable paths. Moon in Pisces needs magic in her daily life. Her relationship must nurture a sense of transcendent possibility, while being protective of her great sensitivity. Moon in Pisces absorbs what her partner is feeling, and (when she’s in martyr mode) she will sacrifice her comfort and safety for her lover. But if she’s developed stronger boundaries, she’ll express this energy in healthier way–deep empathy and healing that doesn’t drain her vital energies. Mars in Pisces will be strongly attracted to the soulmate vibe that Moon in Pisces gives off. He’ll sense that she shares his desire for transcendence, and she’ll be totally comfortable with his gentle yet urgent approach. Although Mars in Pisces is never aggressive, he can get fired up when his fantasies are triggered. Together, they’ll create the ultimate romantic union: a pair of dreamers who dissolve into their own world. The only negative possibility is that if either partner has addictive or sacrificial tendencies, these energies will be magnified in the relationship. Nadia, does house-sign affinity also apply in your opinion? 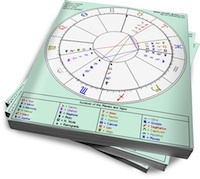 For example if one partner has a natal moon-mars conjunction in the twelfth house and the other person has a mars in pisces, but around the same degree as the partners natal conjunction in the 12th? Should that give a similar vibe? It will give a similar vibe, but mixed with the characteristics of the sign that’s not Pisces.